Secure data wiper cleans all deleted confidential data files and folders from your hard disk drive and other removable USB media to safeguard your computer privacy. 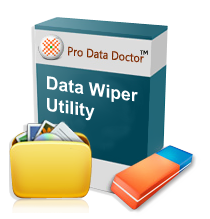 Utility wipes recently used application that includes Microsoft word, Power point, Excel files and cleans unused disk space using multiple disk erasing algorithms. Advanced feature eliminates deleted system files including administrator temporary file, clipboard contents, windows event log, network folder etc. Complete removal of deleted information through overwriting all of the information with system random data. Utility wipes multiple files and directories permanently. Wipes unused clusters that are not currently linked with any file system. View the records before wiping out internet traces and data stored on your computer. Software support FAT and NTFS file system for permanent deletion of erased files and folders. Supports external USB removable media like memory card and pen drive for permanent content removal. Software permanently wipes and cleanup unallocated area of your storage media and delete records of your offline and online internet activities, such as History folders (The history Folder contain links to recently visited websites), cookies, typed URL list, cache internet files and similarly eliminates passwords and deleted documents list from your laptop or notebook PC drives. Very easy to use and does not any technical assistance to operate the data sanitization software.